An aging actor, once famous for his role in a beloved super-hero franchise, is now attempting an artistic comeback in a work of meaning and substance. 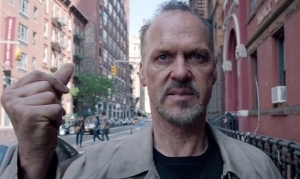 This is the plot of Birdman (in theaters), but also of its star, Michael Keaton, who was once Batman (get it? ), but hasn’t had many hits in the last couple of decades. Written and directed by Alejandro González Iñárritu (21 Grams, Babel), Birdman is a surreal, tragicomic masterpiece, that showcases Keaton’s facets and talent the way no other film has (nor could, for that matter, while he was still at his peak). More than 30 years ago, in 1982, Keaton became a star overnight with his glorious comedic performance in Ron Howard‘s Night Shift. He went on to boast that go-for-broke approach (epitomized in Tim Burton’s Beetlejuice), as well as to plumb underrated dramatic depths (see: Clean and Sober). Ironically, his initial casting as the caped crusader was met with outrage, but he became so synonymous with the character, that future fury was in him not returning for a third outing (Val Kilmer took over for 1995’s Batman Forever). Keaton has continued to work steadily since, though once the nineties ended, his meaty roles dwindled. But now, back on top he is, almost surely set to secure his first ever (!) Oscar nod, and receiving the praise and attention this actor so richly deserves. I’m so glad this movie has finally come to GJ! Can’t wait to see it. Viva La Keaton! Thanks Nicole for this, Michael Keaton is awesome, I have liked him since Night Shift.